Due to the historic D3 drought in our region this season, we opted to delay the start of monitoring slug populations to the 2017 and 2018 seasons. Our past experience meant we knew the work would produce less than valuable results, because slug populations are virtually non-existent during dry times. Additionally, the drought conditions meant that pasture did not grow after the sheep’s first rotation in May. We spent 2016 reorganizing our grazing system to accommodate drought and make use of hedgerows, which will help tremendously as we set out to collect data over the next two seasons. We did lose one sheep to the P. Tenuis parasite in 2016, a previous infection from 2015 that was not treatable. No new sheep were infected, possibly because of the extreme drought and thus poor parasite conditions. Because of new job responsibilities, the original project leader Elizabeth has brought in co-owner and husband Steve Gabriel be responsible for all aspects of implementing, monitoring, and reporting for the project. 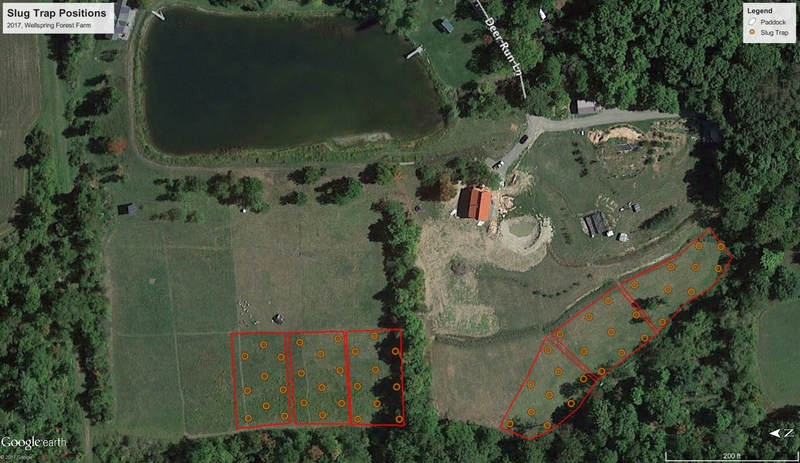 Wellspring Forest Farm is a 10-acre agroforestry and permaculture inspired farm and homestead. The farm is coowned and operated by Elizabeth and Steve Gabriel and we’ve been growing crops since 2011. We also graze our neighbors 20 acres of pasture. Our gross income was $11,063 in 2014. We develop our operations systematically, analyzing resources and challenges of the site, our economic capacity, time, personal interest and market demands. Our main crop is shitake mushrooms, which we sell to restaurants and through a CSA. 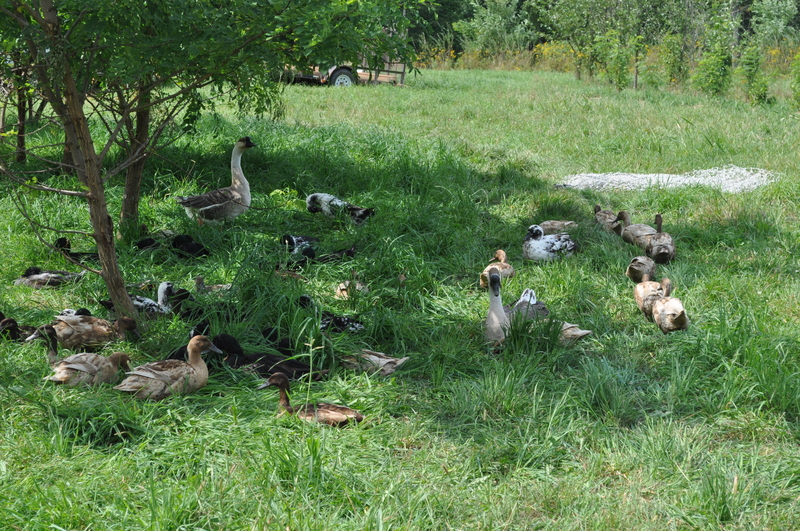 We maintain a flock of 50 ducks that provide slug control to the shiitakes and nitrogen to our gardens. We sell eggs to a butcher and restaurant. Since 2012, we have planted trees to eventually provide wind protection, fodder, shade and wood. Sheep complemented the operation because our pasture is in need of regeneration and sheep are much more sustainable than mowing between the rows of tree crops. We expect to have around 28 sheep in 2016 and have a goal of managing about 20 ewes and 30 lambs each year from 2018 onward. Adding ducks to the sheep rotation, we hope further improve soil health, reduce sheep exposure to parasites and increase farm production. This project builds off our previous research (FNE12-745) where we determined best practices for utilizing ducks to control slugs in our log-grown shiitake enterprise. We are mostly interested in having ducks on the farm for this pest control benefit, but have also found a modest income from egg sales. Our success with ducks in the mushroom enterprise and anecdotally in our gardens and orchard systems has led us to see their benefit to many systems. Moving them into the sheep rotation may be beneficial, but there is likely an issue with getting the proper timing down to have efficacy. Our main question; is it worth rotating the ducks in sheep paddocks to reduce the slug population and thereby reducing our sheep flock’s exposure to parasites? Big thanks to Jonathan, Shaun, and Claire, our on-farm help in 2017 who were awesome and stayed positive even while counting slugs! Due to the historic D3 drought in our region this 2016 grazing season, we opted to delay the start of monitoring slug populations to the 2017 and 2018 seasons. Our past experience meant we knew the work would produce less than valuable results, because slug populations are virtually non-existent during dry times. Additionally, the drought conditions meant that pasture did not grow after the sheep’s first rotation in May. We spent 2016 reorganizing our grazing system to accommodate drought and make use of hedgerows, which will help tremendously as we set out to collect data over the next two seasons. We realized as we planned for the 2017 season that starting to rotate ducks into paddocks would not be useful without first establishing baseline data for each paddock, since it cannot be assumed that slug populations are the same for each location, nor do they stay consistent with the seasonal changes in weather patterns. Therefore, we decided that in 2017 we would collect slug population data and track our sheep grazing, as we might normally do. 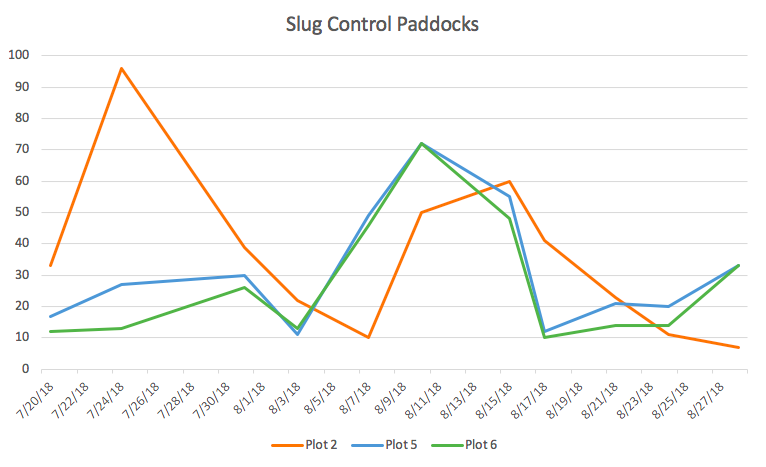 We could then look and see if there are any trends in slug populations, any differences among paddocks, and any correlation with weather events. 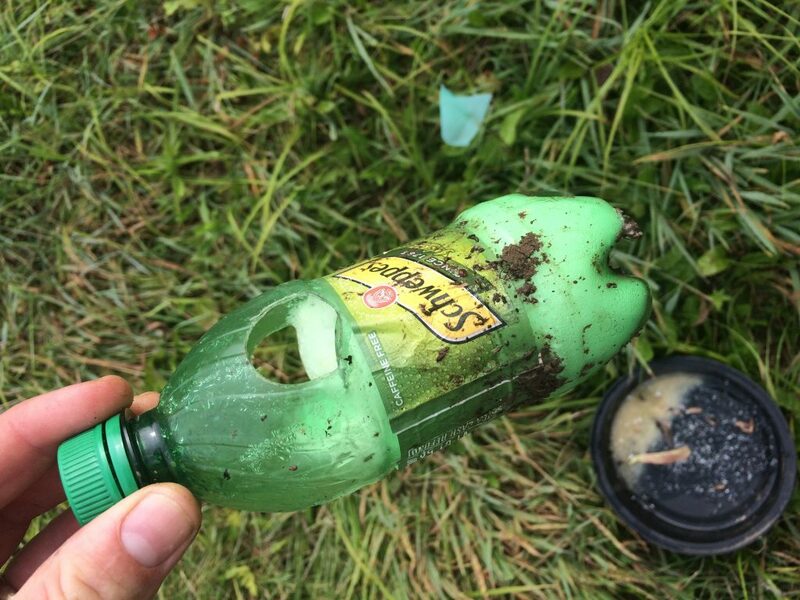 In order to monitor slug populations in 2017, we distributed traps made from soda bottles (see figure 1.1) in 10 locations in each paddock, roughly 50 feet apart. Each trap was sunk into the ground using a bulb digging tool and set so that the opening of the trap sits at ground level. We filled the trap with about 1 – 2″ of fresh beer. The map (see figure 1.2) of these trap shows we aimed for a relatively even distribution of traps, though there is some variability in the shape of the paddock. We selected the paddocks in the wettest locations closest to the woods edge, as we assume these are more likely to have slugs (intermediate host) and also deer visiting the pasture, who are the origin host for the parasite in question. We planned to monitor traps twice each week, counting slugs captured and also emptying and refilling with fresh beer, an important practice to ensure the traps would continue to attract slugs. A basic count of the total slugs was taken per paddock and recorded. 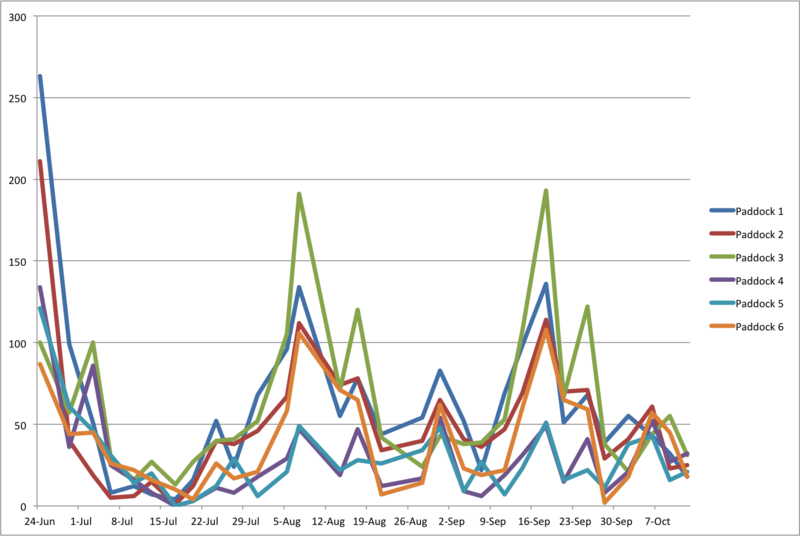 We tracked these figures from June 19 through October 13 a total of about 17 weeks of study. 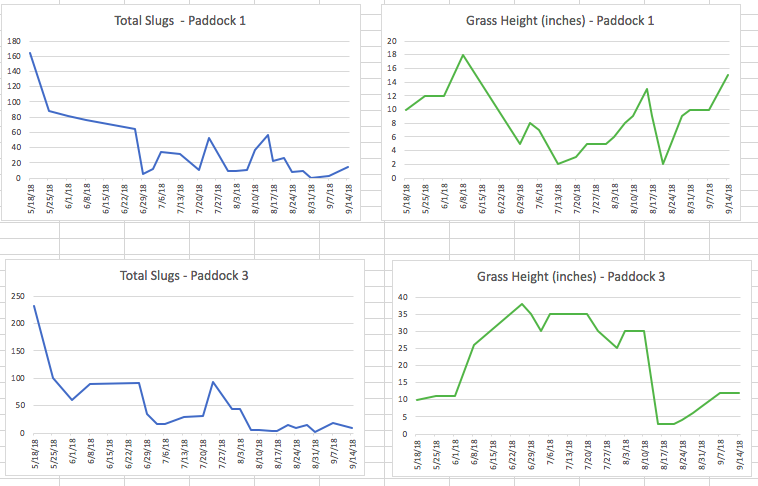 As the graph below shows for the year 2017, results of the data collected indicate there will be some consistency to the pattern of slug presence among the collection of paddocks selected for this study. This is useful as we attempt to add ducks to 3 of the paddocks in 2018, to see if we can affect populations. 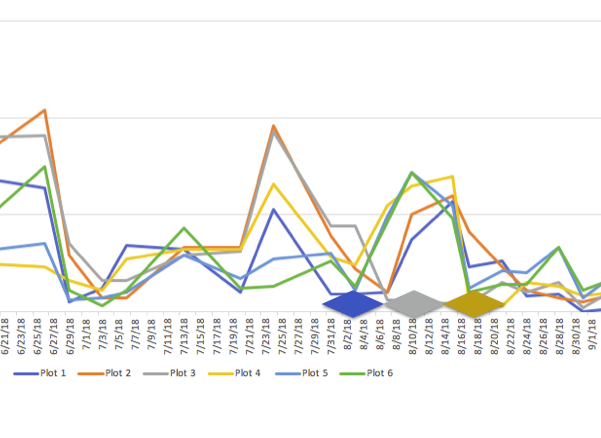 If successful, those paddocks would hopefully deviate from the overall trends. We are ready to proceed to the treatment portion of the research in 2018, and will better track grazing in the paddocks, as well as grass height, as we are curious if this has any effect on slug presence. We will accomplish this by measuring the average height as we take slug counts. Our theory is that less grass = more drying out, which could have an effect. For the second year, the goal was to track the changing dynamics of slug populations in the same paddocks, as well as attempt to implement the “treatments” – that is, a roughly week long residency of the ducks in 3 our of the 6 paddocks, to see if there was any impact they offered to reduce slug populations. While as previously mentioned we delayed the start of this projects in 2016 because of historic drought, 2018 was notably wet, after a normal/dry May and June. 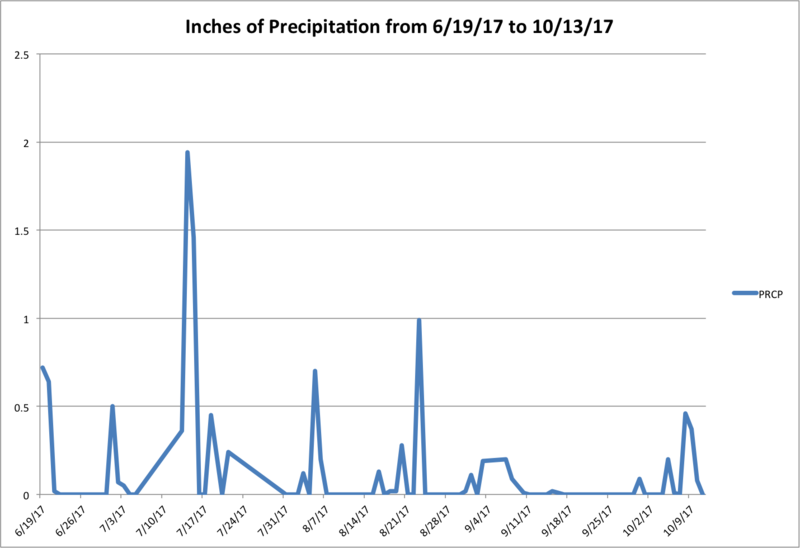 The months of July, August, and September each were 2 – 3 inches more rainfall than normal (almost double the amount) and for the year we are 10 – 15 inches over normal rainfall. This is important to mention from the outset, as the rain likely affected our data, since excessive rainfall was found to flood the traps on several occasions, which dilutes the beer and effectively suppresses the yeasts that attract the slugs. There are two notable patterns when comparing both years that are useful. One is that in both seasons, the highest slug counts were in the spring, though we started counting in late June in 2017, and mid May in 2018. 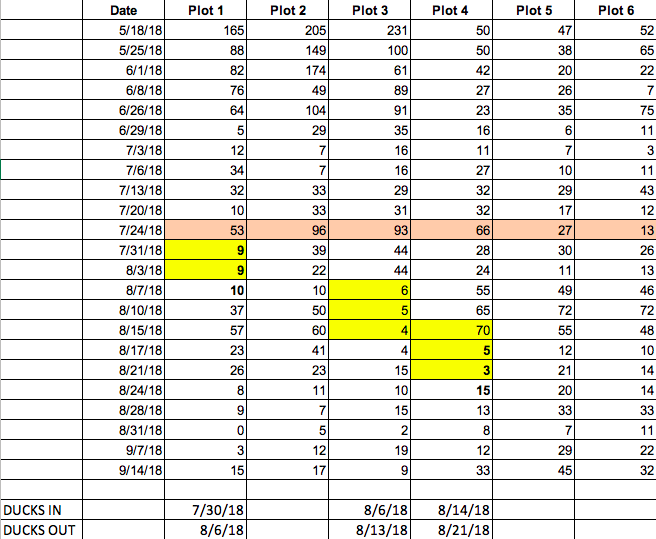 Regardless, in both seasons, the relatively high counts dropped below 100 per paddock by early July, and never returned to the spring and early summertime high points. The other relevant pattern is that… there isn’t really a consistent pattern. Rates are not consistent or constant, but rather ebb and flow. As noted in 2017, rainfall wasn’t a reliable indicator of these dynamics, and in 2018 we looked at grass height, where we also found that the height of the grass didn’t prove to be a helpful indicator of slug levels, either, as noted from a few sample paddock data sets. For some paddocks, we even intentionally let the grass grow very high (see paddock 3) to see if there was any effect – and there was no clear correlation. While we had hoped to do two visits of the ducks to each of the three treatment paddocks (for six total treatments), because of the heavy rainfall and persistently wet soils, we were only able to do one set (three treatments). Our duck house, small tractor, slopes, and mucky soils led to many issues early in the season. The yellow blocks indicate samples that took place during the residency of the ducks in one of the treatment paddocks (1, 3, or 4). Each paddock was randomly selected from the entire sample group as the treatment areas. We attempted to sample as consistently as possible on a weekly basis, sometimes taking an additional sampling point during the season because of the rain affecting the viability of the slug traps. Perhaps the biggest takeaway from this project is how hard it is to track slug population dynamics, given all the variables at play. Important to note is that while some effect was seen above from duck activity, it was not particularly long lasting. 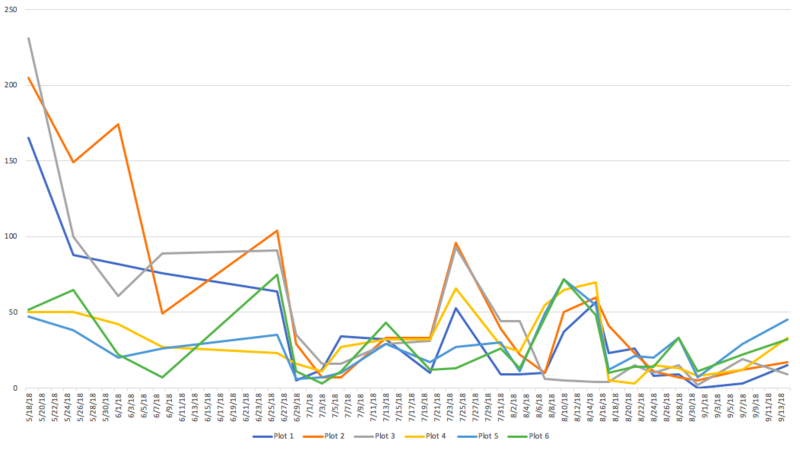 In all three cases, in just a few days after the ducks left the paddock, the slug numbers generally rejoined the overall pattern of population dynamics across all of the paddocks. Since the pastures also clearly needed some rest and recovery time post-duck before sheep could graze, this approach doesn’t seem to be particularity effective when taking in the larger context of our goal, which was to reduce exposure of our sheep to parasites. We found that a paddock needed 7 – 10 days of rest before the pasture was just grazeable, and thus by the time the sheep arrived there would be little benefit of any substantial reduction in slugs. Given this result, and the amount of labor it took to monitor slug population dynamics, and the high variability within the 10 traps in each paddock, there is a larger question about the practicality of this on a farmer level. Even if we could replicate this trial and get better results, could farmers easily decide if and when to put ducks into a rotation in a way that might offer clear benefits to their grazing animals? Since weather, precipitation, grass height, and overall slug population dynamics act independently of each other, there seems to be little benefit in attempting to utilize ducks in this way. Its notable that in two seasons, the population of slugs were significantly higher in the spring and early summer months. Also important is that for both seasons, the really high numbers were in paddocks 1, 2, and 3, which are situated lower in our landscape, border a creek, and often have wetter soils that take longer to dry out. Paddocks 4, 5, and 6 were higher in the landscape and dried out sooner. So, there may be benefit of putting ducks through the pasture in early Spring to reduce the overall slug populations, which could reduce their ability to reproduce. This is the general approach we concluded from our last grant, where we more effectively utilized ducks to control slugs in our woodland shiitake mushroom operation (https://projects.sare.org/sare_project/fne12-745/). The major difference is that its easy visually to see the effect of ducks clearing out slugs on our mushroom crop, but harder to measure the efficacy in pasture, since its literally harder to see the slugs, as well as monitor any effects on the “crop”- i.e. if the sheep are ingesting them (versus the slug damage visible with the mushrooms). We have concluded that while some short term impact/benefit can occur on slug populations from duck grazing activity, it is not enough to justify the labor and time to monitor populations, coordinate moving them into the right place at the right time, all with special effort just to realize a benefit on reducing parasites. In other words, if you are in a situation where you have ducks and are rotating them, you might receive some secondary benefits of running them through pasture, but its not worth going out of your way. While in some respects this finding is disappointing, it is in fact the reality of trying to solve an on farm problem by managing a complex ecological dynamic. At the end of the day, this idea would just be one more way to reduce parasite impact on our grazing sheep, along with breeding and selection practices to favor resistance, and the inclusion of high-tannin forages in their diet to reduce the effects of parasite build up. These two other approaches are likely more effective tools to reduce the impacts of parasites, and they certainly are easier to manage! To revisit our original objectives one and two, we sought to assess if ducks could reduce slug populations meaningfully in a rotational grazing system. We found that while we can potentially reduce a population in a given paddock, the effect is not one that lasts, and is therefore impractical as a meaningful activity. As with any research project, more years and subsequent trials could further improve on the methods and attempt more treatments, which could offer better results. Its very time consuming to measure and refill traps on a more than weekly basis; and it was impossible to do every 2 – 3 days as would be ideal, given that the beer wears out. Should we have found that ducks were effective, objective three was then to figure out a feasible leader-follower rotation for ducks and sheep. Since the duration of any effect is so short, this objective was not able to be met, since we’d need a longer recovery of the forages before getting the sheep on them, when slug populations would potentially be back to more “normal” levels. Slug population dynamics are highly variable, and cannot be predicted using the month of the year, precipitation, or height of grass in a paddock. They rise and fall throughout the season dramatically. In springtime and early summer, slug populations could be significantly higher than during the rest of the growing season, which potentially increases grazing ruminant exposure. Avoid the wettest grazing sites in early spring. Consider this as a place to target with ducks if it’s easy to do without extra effort. 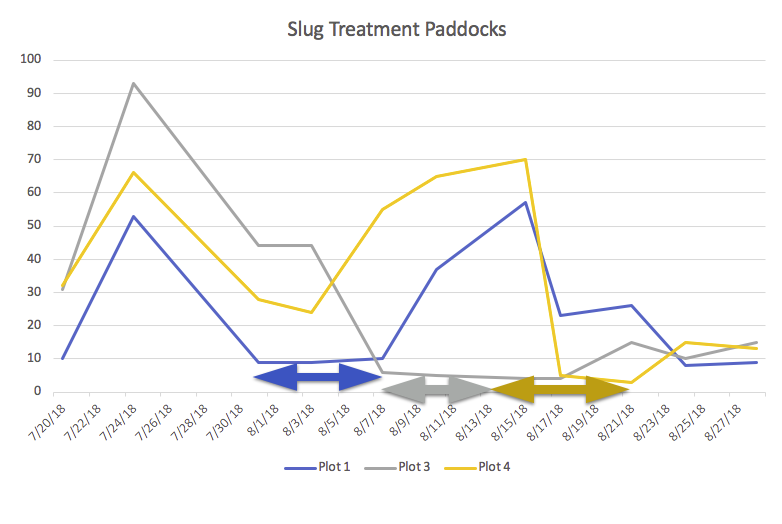 Monitoring for slug population dynamics is difficult, and not a feasible task for most farms to undertake in a way that will provide clear directives for action. Ducks DO reduce slug populations – but maybe not for long periods of time. A holistic approach to reducing parasite impacts on grazing animals suggests that ducks could play a role in slug control, but are not a reliable method to replace breeding for resistance, including high tannin forages in an animals diet, and other methods. We will be offering an educational webinar in early 2019 and are completing and reformatting our guide book to be published before the project terms in March, will update this section during our final report. Will complete during final report.